Create durable yet easily movable artwork and decals in your business or home. 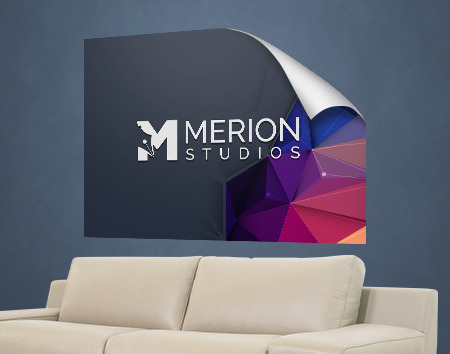 5 sizes from 20" x 16" to 40"x 28"
Custom removable wall decals are a forgiving, durable solution for many interior design and promotional applications. It is long-lasting wall art that is quick to put up, take down, reposition, and stored easily when needed. Wall decals can be used to quickly add artistic details to any space without damaging surfaces. They're a favorite decorative material for cafes, bars, and art spaces. They'll instantly change the vibe of any space in your home or business. Our layout templates also ensure that your wall decals meet our printing guidelines. You can download the right layout template in an EPS, PDF, or JPG format. Use wall decals to convert the look of any space, for as long as you need. Wall decals are durable, so they will last, yet they can also be easily removed without permanent damage or any specials tools. Use them for your business to change the look of your store, office, or work area. The also work as promotional displays so are a good choice for marketers who want to have a more durable yet easily removable alternative to posters and other large format marketing materials. They are available just as fast too. Print wall decals in just two business days, in quantities as low as 1 to as high as 50. You may also use personalized wall decals in your home to add something extra to a room's interior design. Try dinosaur wall decals for a nursery, or butterfly wall decals for a study. Kitchen or bathroom wall decals can be used to spruce up otherwise drab or ugly tiled surfaces without any special tools needed.